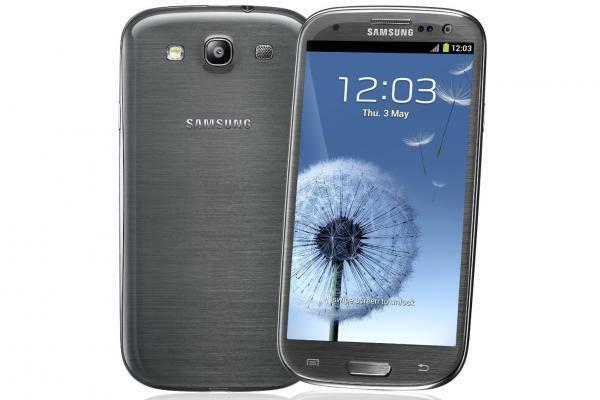 You are here: Home > T-Mobile To Offer Samsung Galaxy S III In Brand New Color Next Month? 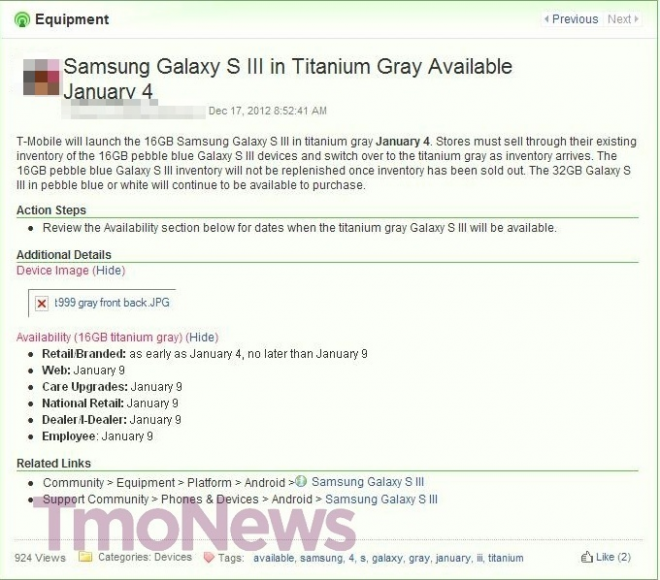 As we wind down the end of 2012, a bit of news to start the new year as word drops that T-Mobile is preparing to sell the Galaxy S III In Titanium Gray. In fact, T-Mobile will drop the Pebble Blue 16GB Galaxy S III, or at least not order replenishing inventory as they transition shelf space over to the Titanium Gray model. The 32GB Pebble Blue edition will continue to be available for purchase. Anyone willing to pass up T-Mobile’s “Last Chance” sale ending on December 31st in favor of a Titanium Gray Galaxy S III model? Picked up the image below off Google Images which shows up as the Titanium Gray model. I prefer the pebble blue. Good, because the first 2 are both kinda on the feminine side, IMO. lol but you are missing the benefits. You set your pebble blue G3 down beside you at the bar, a hot chic comes up, and starts talking about how she loves the look of your phone, and what is it. Bam…instant conversation starter without the cheesy pickup lines. It’s happened to me a couple times. I like my white S3. I got bored with carrying black slabs all the time over the last six years. My last non black phone was an old red BlackBerry 8310 unlocked from at&t. I preferred the GPS at the time since my coverage was excellent and always stood out from the same old Grey or black smartphone level of boredom in the day. They should come with a Magenta color. Of course I wouldn’t buy it, but I think it’ll be a hot exclusive phone in the T-Mo lineup. Doesn’t look much different than the blue really. Now what TM needs is a Megenta s3 & Megenta iphone ! Remember when T-Mobile offered the magenta Razr V3? Not a good idea. You can cross the entire male demographic off the target audience list with that one. I loved the old Moto Razr which in the used market, seems to be making a comeback. It was a great phone and worked very well and used by many long after the iPhone launched in 2007. Also, on T-Mo, pink wasn’t the only color choice for the carrier. Sorry can’t read your articles…too busy playing Gorilla Run! You’re not alone on that issue. Most of my friends on iPhone or even android on other carriers have produced the same problem. Are you using wifi calling? That’s the only time I get duplicates. Titanium is nice and all but when is the Woodgrain Brown coming out to Tmobile? That was a REALLY nice color for that phone. I rocked the limited edition woodgrain finished MT3G for a while. That phone alone was a conversation piece. It was too bad that the hardware itself was rather outdated. Still have the complete package in my closet and was always hoping for a Gibson Les Paul Galaxy S3. Lol yeah the Fender was hot. Ah, what about Black or Red? wait…why get rid of the most popular color? IMO, for every 1 white one I see there are 15 blue. I thought that was the opposite. I know white T-Mobile Galaxy S2 models are rare but I see white Galaxy S3 phones everywhere in my area where the blue on T-Mobile is a rare sight. Hold the phone! This hasn’t occurred since the Helsinki episode of 1919, and I think we all remember how THAT turned out! Quick question i have the 16 gb blue razor with the insurance plan…now wat happens if i breakk my phone or something goes wrong and i have to get a replacement…what will tmo do for me in the timeing of that situation would they send another color of choice or just send a 32 gb blue glaxay or wat ..? I have slight buyer’s remorse on grabbing the S3 in white as it’s the most often seen (almost as much as many iPhones. Instantly recognized by the overall camera and sensor placement. I just keep thinking if the dark blue would have been a better choice but the S3 still looks great in white. The new color looks great but not practical for a early upgrade or full retail purchase as much as I like the looks from the stock photos. Some phones just look great in other than the black slabs from over the years. My other personal favorite was the Mytouch 3G slide in white, it looked like it simply was meant to be that way but other phones that launched in black and then pushed to white never really looked that great to me. I wonder if the “brushed metal” look will last long as it’s most likely a paint effect under a clearcoat finish? No point unless you mummify it in a case or skin at minimum to protect the finish. I retired my limited edition Fender Mytouch 3G to protect it as underneath the woodgrain paint was simply, white plastic. Bought the Motorola Cliq in it’s stead to preserve it. Glad to say that my Fender Mytouch 3G is still cherry and love the looks. If the white back on my GS3 gets scratched up, any other back will match perfectly and in ready supply. Finally… been waiting for a black and/or grey model since the SGS3 launched on T-Mobile. A T-Mobile rep confirmed to me that they will be releasing it worldwide in stores on January 4th, and January 9th online.